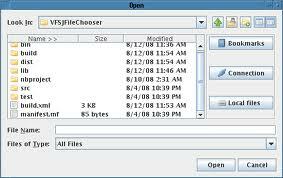 VFSJFileChooser is a Java Swing Component which allows you to browse both remote(FTP, SFTP, WEBDAV, etc.) and local filesystems. It is based on Apache Commons VFS library. VFSJFileChooser is distributed under Apache License 2.0. VFSJFileChooser was first started to be a plugin of XPontus XML Editor. Later, it was decided to create a library which wouldn't be tied to XPontus API. VFSJFileChooser supports all the file systems available in Commons VFS. You can think of VFSJFileChooser as a javax.swing.JFileChooser with the ability to browse remote locations such as FTP, SFTP, etc. VFSJFileChooser has not been designed as a file transfer tool, however it can be easily implemented (2 VFSJFileChooser components and some buttons calling commons-vfs API methods, a queue for file operations, etc. ).